I'm hoping that my other half will actually get around to putting my wardrobes up this weekend! Then I might actually be able to start organising my clothes!! I have managed to fill three bags full to drop to the charity shop tomorrow though - when did I get so many clothes? Great tips! I hang my clothes in categories too. I want to add more comfy, cute dresses and skirts to my wardrobe. During the spring/summer, I prefer those to pants. The biggest problem is finding ones that are long enough and appropriate for work. i've been getting rid of stuff lately and love it! although with clothes it's hard to tell now since nothing in my closet fits right! :) i'd end up getting rid of everything! Great tips, Ashley. With our upcoming move (I need to fill you on that) I hope to completely rethink all of the pieces in my closet. Happy Friday! 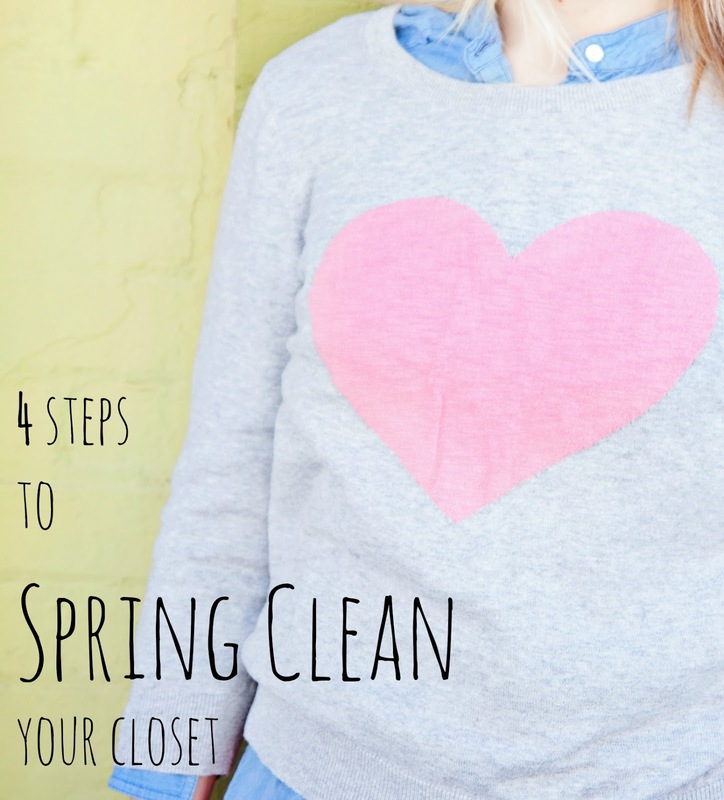 this is awesome since I am planning on cleaning on my closet this weekend!! Love this! I've noticed I've started grabbing hangers out of my husband's closet, so obviously mine is starting to get cluttered. I think my sisters will be excited to see some of the sweaters I want to get rid of! I just switched from organizing my closet by category to color and I don't like it. I can't find any of my jeans! love these ideas! I try to get rid of things that I haven't worn in a year at all. that's my rule! My rule is, if I haven't worn something in a year- chances are I probably won't wear it in the coming year... So unless its a special occasion outfit, that's how I choose what to get rid of. Cleaning my closet is on my to do list this weekend. I'm a little overwhelmed (since we just moved and I still haven't even unpacked some boxes yet) but ready to get it organized!! I've been hanging my clothes in categories and lately I've also organized by color ranging from short to long sleeve (we'll see how long that lasts)! Thanks for the tips! My closet is a MAJOR mess at the moment and I have to organize it, stat! I try to organize by category and color. I recently donated some clothes I had been holding on for years, hoping one day they would fit. But the funny thing is once you loose weight you actually want new clothes to flaunt your new body. It really doesn't make sense to be holding on to things we don't wear but we all do it. One thing I really want to incorporate is a maxi skirt or maxi dress. Have a great weekend! Having an organized closet is a big deal to me. I can't find anything to wear of my closet isn't organized. I do it like you, short sleeves, long sleeves, dresses, skirts, but then I also organize by color within each category. I need to fold all my shirts though. It just feels good to have all your clothes organized, even if the rest of the house is messy. Oh, and I don't know if you've tried this, but wear a long sleeved shirt under that sweater and the itch will probably go away. I had a sweater that did the same thing. these are awesome tips! i am a BIG fan of the spring cleaning. my friends and i do a clothing exchange party quarterly (every 3 mos). we all bring our clothes and trade, anything no one wants goes to charity. it is super fun, inspires me to clean out my closet regularly and i get new clothes out of it! i highly suggest doing it! I have so many clothes in my closet I have a hard time parting with. I have a beautiful silk Shoshanna dress that I adore, but refuse to put on 10 pounds so it fits. I have lots of Dooney & Bourke bags that irritate my husband. "Why do you still have those when I know you will never carry them again?" I really should clear them out, but they make me oh so happy to look at lol. Spring cleaning makes this girl so happy... love your tips, and love YOU! I need to add this to my "to-do" list! Love these suggestions, espeically trying to re-style before you go ahead and toss it! I just cackled.........itchy sweaters that are cute are my downfall. Must get rid of them. My closet is currently a MESS...no, it is a disaster!! So I thank you, from the bottom of my heart for the helpful tips! I love spring cleaning...organized to be exact! I constantly have huge bags going to Goodwill! Girl! I'm going to have to book mark this post because you nailed it! I already have a pretty bare closet but there is so much I can still toss. I'm just sure of it. I don't feel finished with it just yet! I like the "add something new" part of your 4 steps! this is so helpful! i'm actually helping a friend soon revamp her entire closet and this will come in handy! Preach it lady! This post rocks, just got done doing this:) Love the sweater! Great tips, doll! I'm feeling "blah" about my wardrobe lately, so maybe a good, honest clean out will do the trick. I think I'm hanging onto some things that just need to go. And a few key pieces for the spring need to get in my closet, like yesterday! What a wonderful and very helpful post.